This 2 bedroom apartment is located in Gare de Cannes and sleeps 6 people. It has WiFi and air conditioning. Ideally located, 2 minutes walk from the Croisette, 100m from the Palais des Festivals, in the city center, close to all shops and restaurant, this apartment will seduce you with its large living space, relaxing atmosphere, refined, its modern layout. This newly renovated apartment is peaceful, bright and fully open. It is located on the 1st floor of a small condominium in the city center and has an elevator. The living room is extended by a canopy hosting the master suite. The intimacy of the place is preserved while having a small contemporary industrial stamp. A spacious bathroom, with double marble basins and bath, is an extension of the room. The second bedroom, smaller, has its own shower room with washbasin. The kitchen opening onto the large living room offers all the modern equipment expected. The apartment is very bright and very bright thanks to its 3 high windows all benefiting from a small balcony. A sofa bed in the living room can accommodate an extra bed. 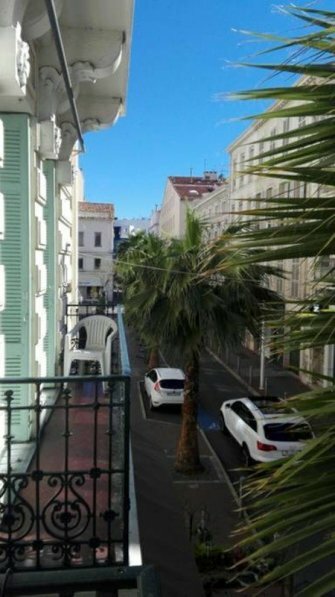 This comfortable apartment will offer you the opportunity to spend a pleasant holiday, it is obviously due to its geographical location, ideally for a stay on the occasion of festivities Cannes or congress.